i just won a hello pilgrim fat quarter bundle from her! i would love to keep the tradition going... i love this bundle very very pretty! I love the Hello pilgrim too! Been lusting! I love going to Canada and kayaking on the lake. Recently enjoyed revisiting a summer road trip across the US via old family slides. I love the color bundles she's been putting together, definitely stash building helpers! Favorite summer memory -- all of the family together at our place in VA, eating crabs, laughing and just enjoying the weather and beauty of the bay :) can't wait for this year! The Hanauma Bay bundle caught my eye this week - dreamy! Summer, hmmm, probably last summer, when my daughter arrived home from college for the entire summer. This summer she is only coming home long enough to see her little brother graduate from high school...Again, thank you! My favorite FQ bundle is Cool Breeze. I need purple in my stash! i am a follower great bundle !! My favorite summer memory is when I would go to Camp Luellamay as a kid. I loved that camp and loved the activities. Went every summer for years, starting with a week and ending with 6 weeks at camp. I would love to go to that came one more time before I leave this earth! My favorite summer memory are the family picnics with my mom and dad when I was a little girl. They most always included my mom's fried chicken,baked beans,and potato salad. My dad is no longer alive, so these memories are precious to me. When I was 10 my Grandma, uncle Frank, and I drove to California. It took 3 days to get there. We stopped at the Grand Canyon on the way. We stayed 5 weeks at Uncle Franks house. It was the best trip ever, but I did get homesick. My favorite bundle would probably be the Fruit Slice - Fat Quarter Bundle Entire Collection by Khristian A. Howell, not normally into fruity fabric, but this is pretty neat looking! Again, thank you! My favourite summer memory would have been the last time we went out to the cabin in NW Ontario. I was 9 yrs old and I spent the whole summer out there with my gran and any other relatives that would come out for a weekend. My favourite FQ bundle is cosmos. Congratulations on your 500th post...actually 502! I am a follower, just signed up! Some of my favorite summer memories were hanging out at the lake (Wylie) in South Carolina with my friends and family. Favorite summer quilt...would have to be one my grandmother had in her spare room, it had lots of chenille squares, and the neatest pink, aqua, yellow, and mint flowers, I can close my eyes, and thinks about it, and go back to simply wonderful times! My bundle pick would be Hanauma Bay. Oh my, LOVE LOVE LOVE apple of my eye, I have a grand niece due this summer, what a fabulous quilt those would make...come on APril!! My favorite summer was when my hubby and I drove from MI to CA, stopping at 10 national parks along the way!! The Summerlove complete bundle is probably my favorite, with the Desert Dreams right there next to it! My biggest problem is that I love all fabric!! My fave fat quarter bundle is "Flock". So pretty! Lovely bundle, so fresh and summery! Hmmm, best summer memory? Vegas baby!!! My best memory was the 4rh of July 1984 when I had my first date with the guy who became my husband. I saw fireworks! Still married over 25 years later. I'm digging Desert Daydreams in Sedona color way. My favorite summer memory is playing in the woods behind our house when I was about 8 - forts, frogs, and secret passwords! No little sisters allowed...until she told on us! I love pretty much everything in Julie's shop but today I'll pick Fruit Slice FQ bundle. That's so awesome of Julie! SO glad you get to sponsor a giveaway! So let's see... best summer... I think that would have to be the summer after I graduated high school. My best friend and my family went on a two week vacation to California where we hit up Sea World, Disneyland, California Adventure, Catalina Island and shopping. Of course, shopping. Then I came home for a day to wash clothes and turn around to go to summer camp, which I always really loved growing up. Then I came home for 2 days, washed clothes, then repacked to go to Royal Family Kids Camp as a counselor. Then I came home one more day, washed clothes and went with my hubby (then boyfriend) and his parents to his parents' condo in Oceanside for a week where he told me he wanted to marry me! It was a good summer. And yeah... I was a young bride. My favorite summer was when I went to summer school at UCSB. Coming from NY it was a wonderful change for a few months, despite the school workload! I love Peak Hour, now in Julie's store. I like Tangerine Tango bundle! My best summer was the summer I met my husband. We both lived at the college dorms and my awkward, shy self would hang out by the dorm pool when I know he'd be walking by. I know, total stalker lol. Anyway he finally came and talked to me one day and 10 years later we're still together! HAPPILY FOLLOWING YOU VIA BLOG LOVIN'! happy 500! My favorite summer - will hopefully be this one! my little girl is turning 2 and I'm soooo excited to take her to the beach and splash parks! LOVE GOING INTO GLACIER NATIONAL PART TO TOUR AND HAVE LUNCH! I love Summerlove, I've been trying to avoid the temptation to purchase for weeks! Happy 502!!! My favorite memorable Summer was all the band camps I went to in Kansas right before my senior year of high school. Great times!!! Oh vintage modern. She hooked me with the swoon blocks! I adore the Impressions - Fat Quarter Bundle in Purple and Citrus! VISITED IT AND I'D CHOOSE "APPLE OF MY EYE'! THANK TO YOU AND INTREPID THREAD FOR SHARING! I love the Desert Dreams! My favorite summer memory is the birthday present of a hoarded orange that my friend gave me while we were in Russia. It was my 16th birthday and neither of us that had citrus for a month. We shared it and sat there in the sun sniffing the peel. It was glorious. Like edible sunshine. my favorite summer memory would have to be the year I moved here to the Gap. I love it here and I can't imagine being anywhere else! I love her Fade to Black bundle! just came over from julie's blog. i am a new follower. I'm a new Follower of yours. Happy 500th (502) blog post! favorite summer ... i spent a month in africa traveling around the countries and doing some pretty insane stuff. My fave Summer memory is spending time several years ago at a friend's place in West Virginia. They had large tents set up before building a home and it was outside living - really cool. Fave fat qtr. bundle from Intrepid Thread is the Poetica complete collection plus.. Go big if you're dreaming right! Favourite summer memory.....easy, if I'm thinking recent. Last summer we drove with our two kids to California and went to Disneyland and it was awesome! 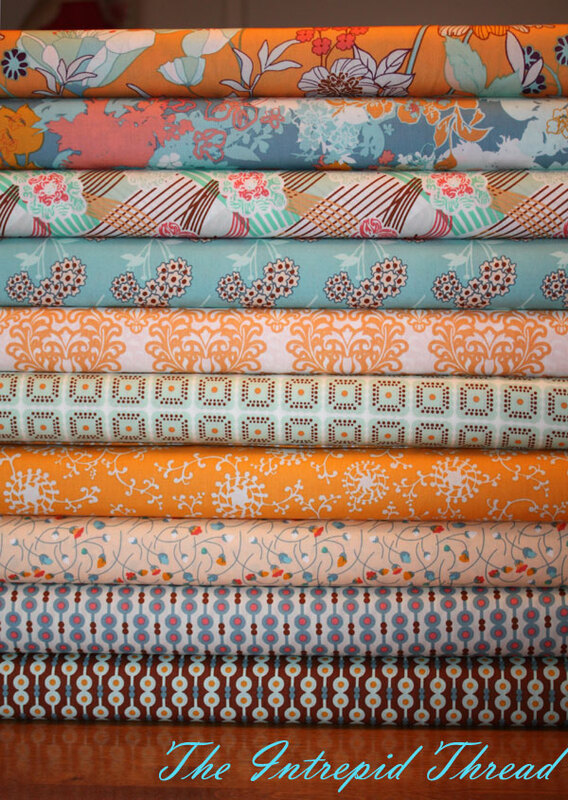 My favourite FQ bundle in the shop is the Impressions in Citrus. I am a new follower to your blog. Thanks! My favorite FQ bundle in Julie's shop is currently Cosmos. Favorite summer has to be one of many trips to Yellowstone. We LOVE that place and would return every few years if the budget would allow. I think we've already been there six times! So pretty! I've been thinking a lot lately about the summer after my son was born, watching him experience sand and open water for the first time. I can't wait to see my newest baby's reactions to those same things. My favorite summer memory would have to be the trip to St. Thomas a few years ago. We had so much fun just hanging out at the beach and playing in the ocean. Such a relxed pace! So pretty..lately i have been attracted to the orange and turq combos...and summer is my favorite time of the year. Nothing better than a hot Southern night. Favorite (childhood) summer memory: a week @ Merry Meeting Lake, in New Hampshire with my cousin. Favorite (adult) summer memory: a cruise for my husband and I to the Southern Caribbean. I am a new follower! Yea! Congrats on your 500th- great stuff! My favorite summer memories involve walking along the river in the woods. The smell of pine needles baking in the sun and the refreshing rush of the water! Yum. I love all of the bundles Julie offers! I really like the Summerslove-Sunkissed by Pat Bravo bundle. It would make great Granny Squares!! I follow your blog now. I am going to Sewing Summit too so I will have to look for you there! I love the Cosmos line, so I pick one of those FQ bundles as my fave. My best summer, hmm, probably the summer of 2009, when my husband and I got married (awww!). :) Thanks for the chance! Favorite FQ bundle is Cosmos in Azure. Lovely!!! The summer our family went camping to PEI - it was incredible!!! My favorite summer memory is the year my husband retired and we were able to start traveling in our rv. I love Flying Free fabric line - sweet!! I'm a new follower...thanks for the chance and congrats on your 500th blog post from me and Julie! Favourite summer - one when my kids were young and we had a hot sunny summer. We spent most of our time at the beach or the swimming pool, except when hubby was home from work and we would go boating. So relaxing! Congratulations on your 500th (and 501st and 502nd!) post! My favorite summer was the summer I turned 16. My dad and stepmom gave my twin sister and I a used car for our birthday, about 2 weeks later we both met 2 guys (who were great friends) and we started going out with them. Had a lot of fun, and he treated me great! Summer ended, and it was back to real life. As much real life as a 16-yr-old had back then! LOL! I got older, and summer was just another season in the year. Favourite summer? The lazy crazy summer I started dating my hubby. I smile still, thinking about it! My favorite FQ bundle is Poetica in Seafoam Symphony. It is every thing you need to make a quilt :) and the color combo is so sweet. I'm a new follower through BlogLovin'. My favourite summer memory is from when we lived in Ross -on-Wye. We used to spend weekends with our friends (who are with us here now) sharing whatever we had in the fridge! I am a follower. I am not a lucky winner, so if you could pull soemthing out of the bag this time, I'd be ever so grateful! I love Fade To Black Fat Quarter Bundle at Julie's shop (and thanks to her for pointing me to your blog!). My favorite summer was the last summer with my dad. Thank you for the lovely giveaway! As far as favorite FQ at Intrepid Thread....SO MANY: Peak Hour & A Walk in the Woods among quite a few! Besides Summerlove, I really like the "From Cream to Curry" FQ bundle. Woodland Tails are very cute! Every summer is my favorite, especially when I get to go to the beach with my niece, nephew, and daughter. My favorite bundle is Maya! Probably my favorite summer memory is getting married to my wonderful dh. We got married in Santa Barbara. Best summer? When we took a missions trip to London, England! My favorite summer memory was a family trip to Germany when my husband returned from a deployment to Iraq. My husband and I had lived there before we had children, so it was very special to show the country we loved to our boys. Thanks for the chance to win! First time getting up on water skis - that was a fun Summer! I am a new follower of your blog - glad this giveaway led me to it!! LOVE the Impressions Bundle in Green and Brown! I'm already a follower of your blog. Congratulations on over 500 posts! Awesome! Thank you and the Intrepid Thread for a super giveaway and a chance to win a gorgeous Summerlove bundle. My favorite summers were going to the beach with my family and boarding all day, then getting fish and chips for supper on the Pier. I am very excited about the Quilt Blocks line that Julie will have in her shop soon! Thanks for the great giveaway!! My favourite memory of summer is eating watermelon and white cheese in Turkey. I am new to your blog and I am looking forward to read more as a follower! Best summer? I think that would be the first one my family lived through in Texas. We had just relocated to Dallas, after living for generations in a small town in NJ. None of us knew any one and we spent the long hot days watching old movies followed by leasurely evenings of swimming and eating nachos. There was a wonderful feeling of peace to the whole summer. I also folloe Julie at Intrepid Thread. I still am highly enamored of her bundle From Cream to Curry-- Delicious! And, yes, I am a very happy follower of your ramblings. I love woodland tails in blue! So sweet! One of my favorite summer memories was one of those that had a Lunar eclipse. It was really hot outside, and all the neighbor kids stayed up late, running back and forth on the melting asphalt to our houses, waiting for and "watching" the eclipse! It was a hard decision, but I have to say that the Flock fat quarter bundle by Thomas Knauer is a top choice. So pretty. Impressions in Purple and Citrus jumped off of the screne and shook my hand, so i guess that is my favorite. I have lots of fabulous summer memories, most of them centred around the beach. We head to the beach every summer for as long as we can, so every year is a favorite summer!! I just love being by the waves, the sand and the sun! Congrats on 500 blogs. I am now a follower. My favorite summer was the first summer I had a car of my own. I would pile all my friends in it and we would drive to Disneyland for a couple days. Congratulations on your 500th post. Favorite summer memory - 2 weeks at my great-uncle's cabin by a lake. There was no tv but we always had great fun - my grandfather always made sure of that! I follow you. Thanks for a sweet giveaway! My fav summer by far was spent sailing around Europe with my grandparents. We went to France, England and Ireland. It was amazing. I am a new follower. Congrats on your 502nd post! I am a new follower, thanks. I love the new Peak Hour line. Great for my new baby boy! I like Hanauma Bay a Teal Fat Quarter Bundle! Congrats with your 502 posts! I am a follower of your blog, Julie's shop is awesome! Too many summers to find just one memory. We always have great times. But there was the summer I spent 6 weeks touring Europe with my family and 6 weeks after that getting married. Although my sisters say I was a bore on the trip, (always mooning around) I have great memories and then, well, all I can say is we're looking at 43 years of wedded bliss this summer.Yup, it was a great summer! Thanks for the trip down memory land. Best summer so far is when we retired and moved here. It is so beautiful and we fell in love with the island the first time we visited it. I remember the year we spent a week camping in The Great Smokry Mountains with our three kids. Another family from church camped with us and we all enjoyed it so much. Thanks for the great giveaway. My current favorite bundle would have to be Vintage Modern. My problem with fat quarters is I just love to look at them and run my hands over them. It takes something to cut into them because them they will be gone and I won't have any more eye candy. So I love all the collections. But if I were choosing I love Cosmos Vermillion and Power Pop. Love that yellow. Thanks. I love cool breeze and congrat's on your 500 post, thanks so much for the awesome giveaway. I'm now a follower of your blog. Congrats on 500+ posts! My favorite summer is the summer of 2009. It is my most cherished and most devastating. My dad had terminal cancer and I got to spend every day with him, we got to know each other on such a deep level and he got to see me as a grown woman instead of always seeing me as his little girl. I will always cherish this time. He sadly passed mid summer and he told me he would talk to me every day. Even though I don't hear his actual voice I know he beside me everyday. My favorite summer is when I went to California to visit my youngest daughter...I fell in love with San Francisco!! What a gorgeous bundle! Julie is my favorite fabric lady! My most cherished summer memory is the summer I spent taking day trips on horseback through the Porcupine Hills of southern Alberta (our home) with my father and having his undivided attention and basking in the joy of listening to his stories of the cowboy life. Best summer memories were at the family cottage swimming and learning to waterski!! thanks for this chance to win the beautiful fabric. I love the Hanauma Bay bundle. I have wanted the woodland trails bundle. I think the hose fight with the Mr. last summer was great while we were washing the cars. congrats on 500! I loved the Disney vacation I took with my family and now-fiance, a couple of years ago. My favourite summer is all of them! Warm weather and family visits happen every summer! Love them all!